Employees who work in the maintenance department are responsible for maintenance and repair work of buildings and job sites like offices, apartment complexes, government agencies, and schools. They are the ones who help in keeping things running smoothly. Most have this notion that maintenance jobs are easy and scheduled; but the truth is, it is one of the hardest jobs with lots of challenges, and they are always expected to live up to those challenges. The following Job Description Templates will give you a better idea on the same. Maintenance technicians are responsible for the overall maintenance of an apartment complex, and they look after all areas related to the day-to-day operations of the community. 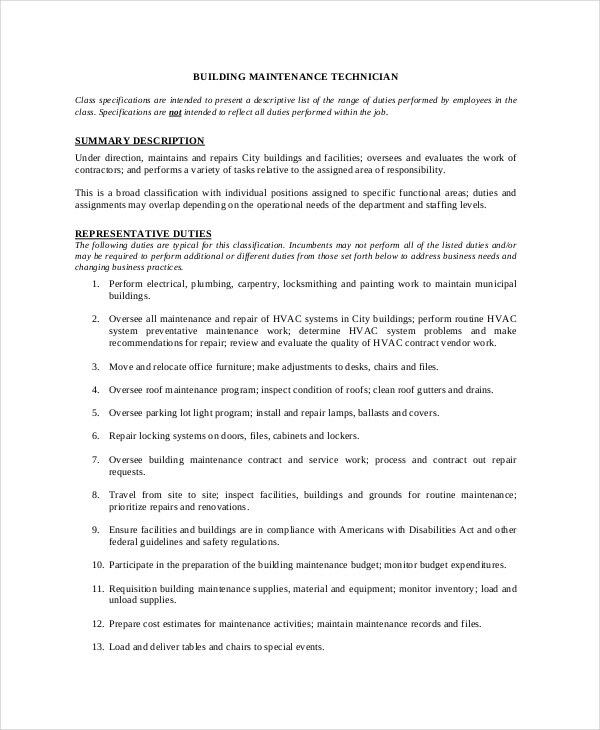 This Apartment Maintenance Technician Job Description template will give you detailed information about the various roles and responsibilities that they need to perform. You can also check Supervisor Job Description templates. 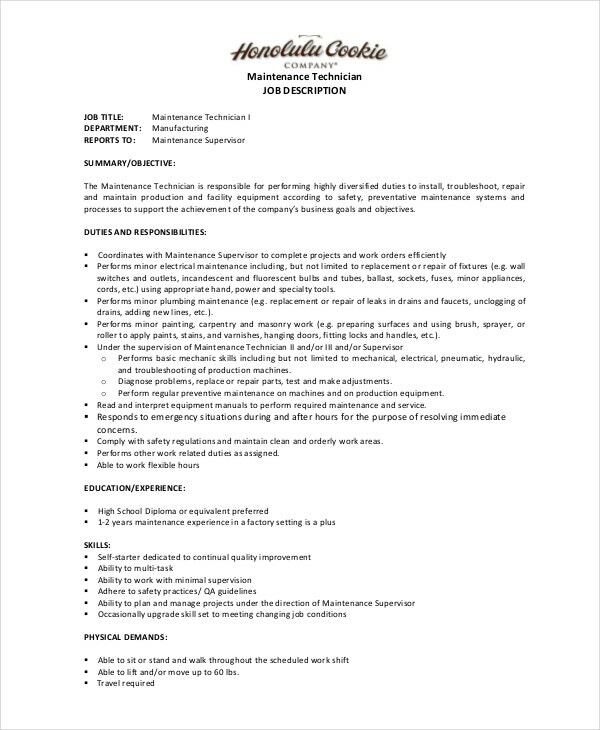 Industrial Maintenance Technician Job Description template will offer you an insight into the role of an industrial maintenance technician. It throws light on the required qualification, licenses, experience and it also explains the physical requirement of the candidate. You can also see Office Administrator Job Descriptions. Income maintenance caseworkers deal with determining the eligibility of clients to receive assistance through the department of social services. 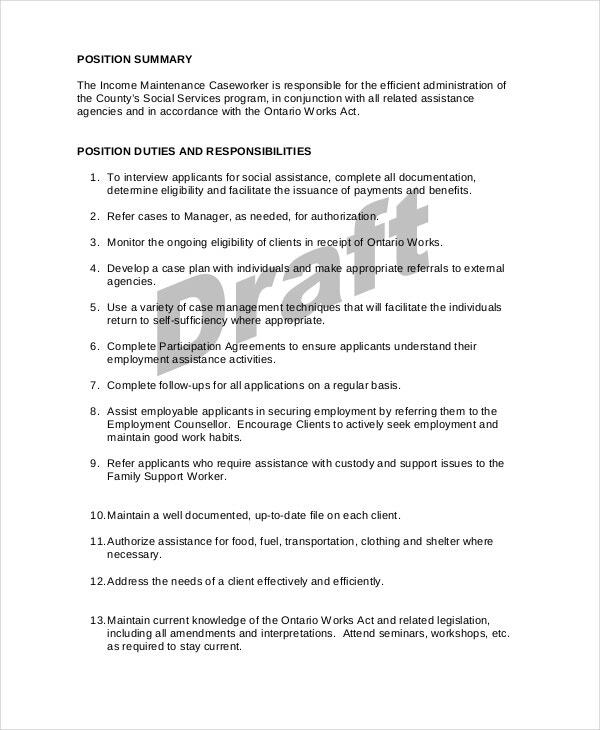 The Income Maintenance Caseworker Job Description template offers a detailed description of the various roles and responsibilities of the income maintenance caseworkers. 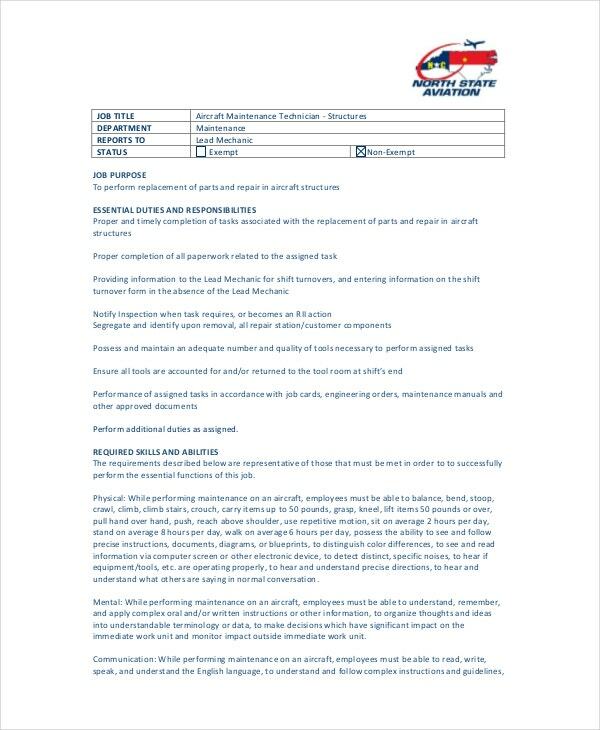 You can also check Quality Assurance Job Description templates. The facilities technician is responsible for the repairs and maintenance of all the available facilities within a particular geographical region. They act as the prime contact for emergency situations. They also look after the security of the employees in various organizations. 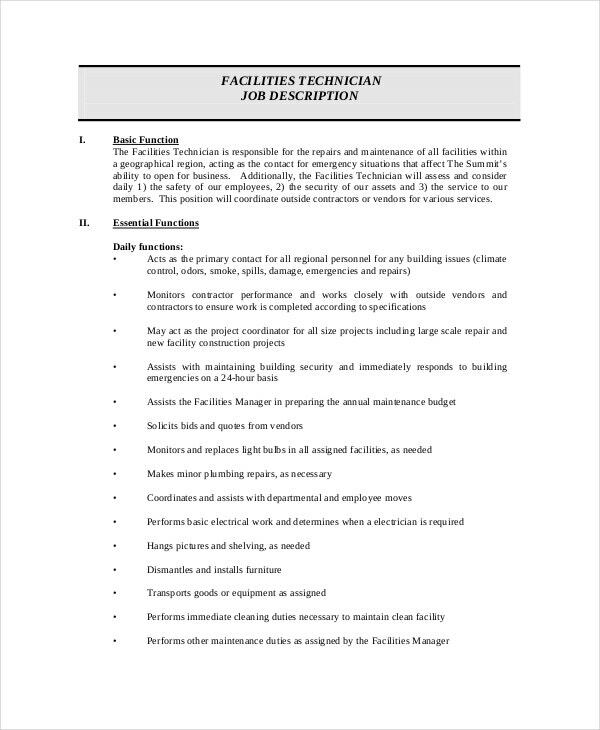 If you are looking for more information, kindly check the Facility Maintenance Technician Job Description template. > Who can use these Maintainance Job Description Templates? Whatever be the nature of a job description and whether it is crafted for general jobs or the specialist, it needs to have its target audience, who can make its best use. Likewise, the Maintainance Job Description Templates are aimed at the industries and factories that need technical monitoring now and then. You can also see Sales Manager Job Descriptions. 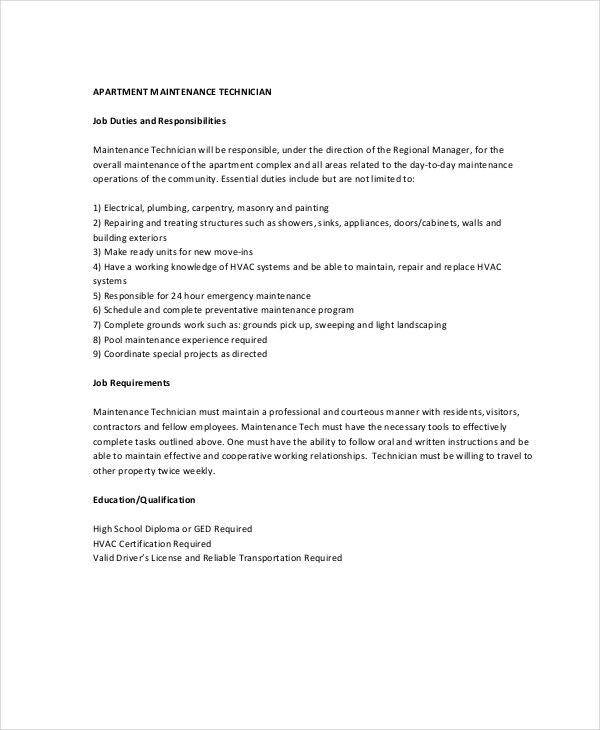 These job description templates can also be used by the aspiring candidates as well who believe they have it in them to make it big in the maintenance department of various organizations. These templates will give them a basic idea about the roles and responsibilities they need to undertake if they get hired by any organization. 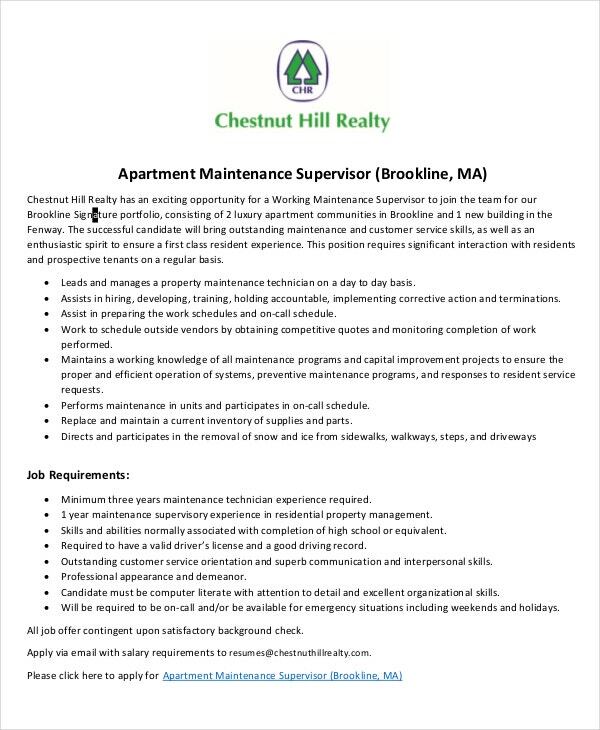 An apartment maintenance supervisor performs a range of duties like managing property maintenance technicians on a daily basis. 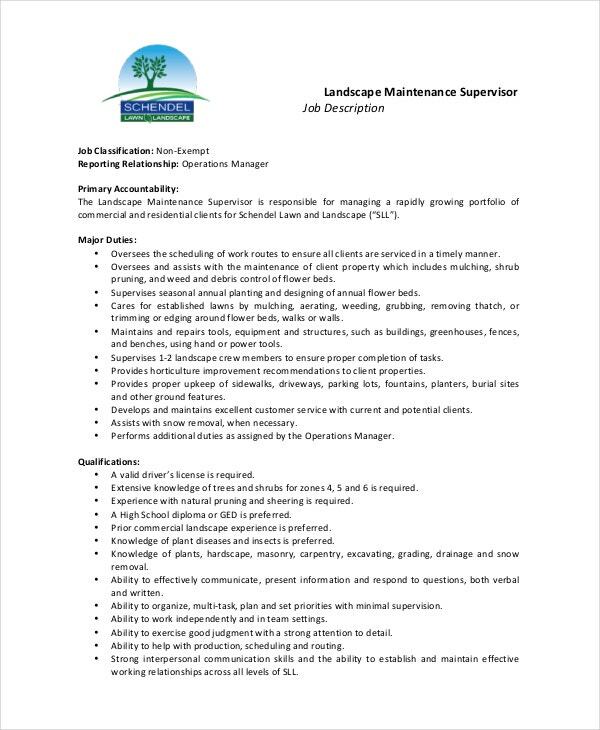 This Apartment Maintenance Supervisor Job Description template will be a perfect choice for you if you want a detailed description of the role of an apartment technician supervisor. 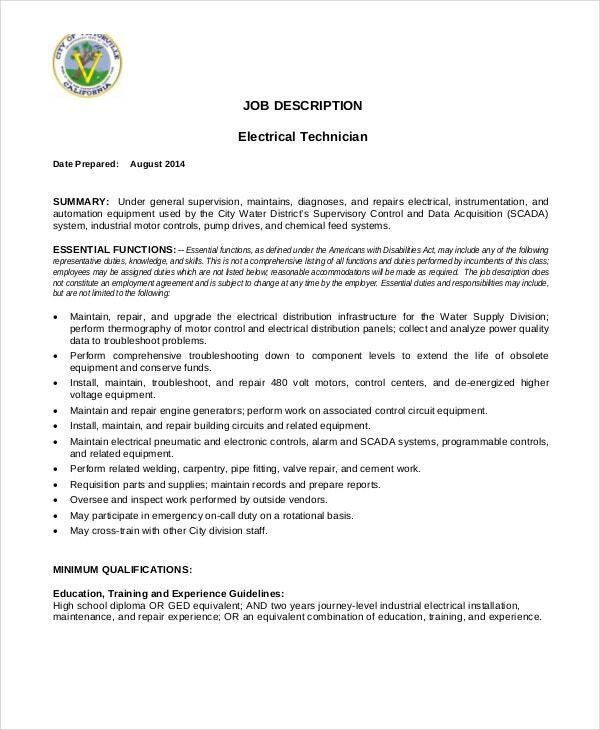 > What are the benefits of these Maintenance Job Description Templates? 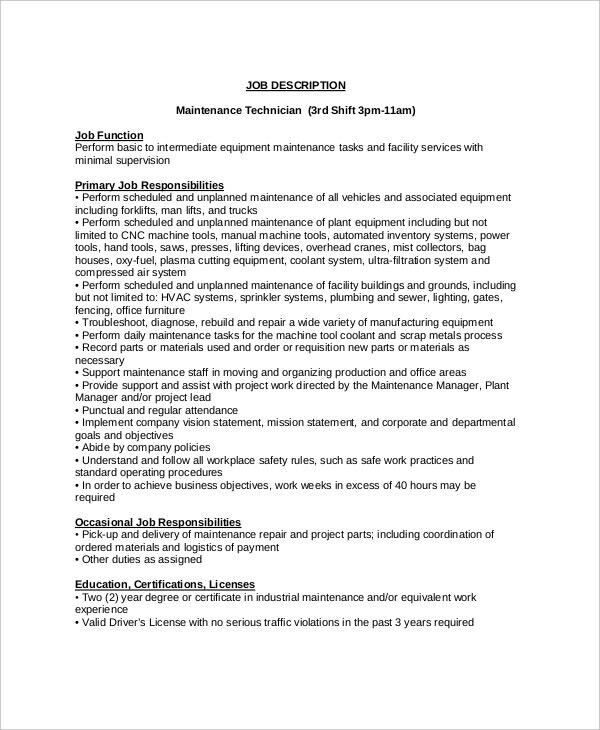 We have a vast collection of Maintenance Job Description templates that you can go through to get a better understanding of the various roles and responsibilities that a maintenance worker needs to carry out. As an employer, you can customize these templates as per the requirement of your organization to get the best candidate that will suit your required job position perfectly.